November 15, 2009, supported by Mitsubishi Electric Corporation Overseas Marketing Group, we presented FX training kits (Factory Automation products of Mitsubishi Electric CO., Ltd) to Industrial Automation of Hanoi University Technology department, which is the first established technological University in North Vietnam and known as a top authority of Vietnam technological universities. There are a lot of talented professors who has studied in Japan, and we are continuously planning to support them. Many people, mainly university staff, participated in the presentation ceremony, it published on newspapers and magazines later. We hope this presentation will help to produce technical specialists of Mitsubishi FX products and develop industry in Vietnam. I.F.A. exhibited Mitsubishi Electric FA products at Institute of Integrated Electrical engineers of the Philippines. Manila November 4- 7, 2009, IFA exhibited Mitsubishi Electric FA products at Institute of Integrated Electrical engineers of the Philippines which is one of the biggest exhibition of electrical machines and home appliances in Philippine. They exhibited PLC, Inverter, Servo and HMI at the exhibition to appeal Mitsubishi Electric FA products and themselves. As a consequence, more than 500 companies, both Japanese and local companies, visited their booth, and I.F.A. was recognized as an agent of Mitsubishi Electric FA products. 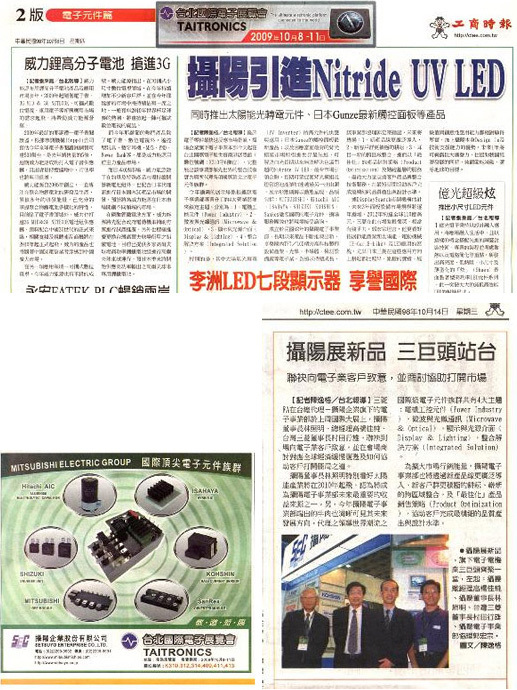 Mr. Albert W. Wang: President of Integrated Factory Automation Inc.
SETSUYO ENTERPRISE CO., LTD. took part in Taipei International Electronics Show. October 8- 11, Taipei International Electronics Show (TAITRONICS) was held. Mobilization was over 5 million people (4 days), and this show was one of the largest electronic exhibitions in Taipei. We collaborated with 10 companies to exhibit Electronic products and we had a great success to contact many customers in our booth every day. This time we shared 3 areas in the booth to appeal each unit's character individually. 1)Display: Exhibited touch panel, TFT-LCD modules and peripheral parts, we appealed our total support service. Not only Taiwan, but also other Asian countries gave us a lot of inquiries. 2)Power kit solution: Exhibited power modules kit products, we received so many questions and so many inquiries. It was a big harvest for us aiming to be a solution kit provider. 3)Communication: Exhibited optical fiber communication devices and power amplifiers for cellular phone. We made to excavate the underlying demand and proposed to replace new applications. We got certain response at this show and continuously provide "Community-based" service to Taiwan local customers and propose high-quality kit-solution. This exhibition was widely reported in the media. Seoul, October 8, we held Mitsubishi Electric the latest DLP®DATA DISPLAY WALL “70 SERIES” exhibition at Imperial Palace Hotel. This “70 SERIES” which has the same high quality as the old “50 SERIES” is added new features by Mitsubishi Electric’s high qualify technology like autonomous brightness and color balancing system and internal processing capabilities. The exhibition room had decollated with ideas to appeal those new features and technological staff has been constantly explaining and receiving questions about them. After all, this event was successfully closed. We have the No1 share on display wall market in Korea. About 150 people (mainly Government office and civil agency staff) participated this event and we had a certain big step at this exhibition. INTEGRATED FACTORY AUTOMATION INC. was appointed as our Sales Agent in Philippine. Philippine, October 1, 2009, we appointed INTEGRATED FACTORY AUTOMATION INC. as our sales agent of Mitsubishi Electric Factory Automation products.They expand FA business based on the new office in Manila. They have a sufficient training room in their office and intend to have training session actively to customers.I.F.A. was established as a FA product's special sales company by APEC: a company importing food processing machine from Japan and selling in Philippine. In this market, which needs high level engineering support, technical service and system proposal, we much expect I.F.A. to develop new customers with efficient skills cultivated by importing and selling machines.In the CC-LINK Booth standing next to the SETSUYO booth, we introduced the Mitsubishi Electric Advanced Open field network, we hope much more wide spread of Japan open field network CC-LINK in Taiwan. 2009 CHURCH ARCHITECTURE INDUSTRY FAIR in Korea. September 2009, CHURCH ARCHITECTURE INDUSTRY FAIR was held in Korea, we exhibited Mitsubishi Electric projectors at this fair. A lot of church stuffs as well as architect designers and equipment suppliers took part in this fair. We appealed Mitsubishi Electric projectors quality and tried to get more products’ visibility. At this fair Mitsubishi Electric was the only company who exhibited visual equipments. Our booth took mach attention and over 200 church officials visited our booth. We were succeeded in appealing Mitsubishi Electric brand projectors in Korea. Originally Mitsubishi Electric brand has high resolution and high quality products lineup, so the features of projector match users’ demands. We got certain feeling to get more share in this market.